Flawlessly apply foundation, powder, blush or bronzer with the Stippling Brush. The duo-fiber bristles evenly disperse product for buildable coverage. Whether you are looking for a sheer wash of color or smooth, full coverage, the Stippling Brush provides the perfect application. The brush's versatility makes it ideal to use with liquid, powder or cream cosmetics. 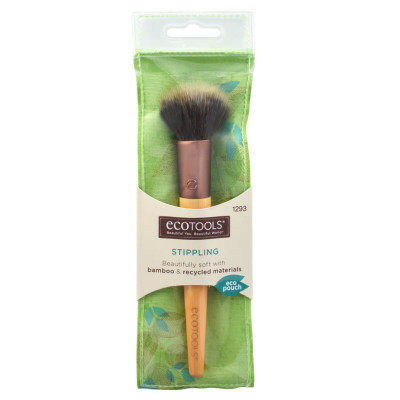 EcoTools® Cosmetic Brushes are made with cruelty-free synthetic bristles, sustainable bamboo handles & recycled aluminum ferrules. Our reusable eco pouch is made with natural materials and EVA. EVA is free of phthalates and PVC. EcoTools® paper packaging is made from 80% Recycled and 100% Recyclable Paper. Brush ini multifungsi sekali. Flawless untuk apply foundation, powder, bronzer, dll.